As you see on this head-spinning graph below, the total amount of money in the world is $84 trillion. But that includes money in the bank. In physical coins and notes, the total global money supply is only $31 trillion. See the problem? Hence the rise of Bitcoin and other cryptocurrencies. Bitcoin is the cryptocurrency that refuses to die. Its demise has been predicted numerous times, and one expert calculated that its value is eighteen times more volatile than the U.S. dollar. Yet the virtual money keeps going from strength to strength. Last year, Bitcoin became more stable than gold, and earlier this year, the price of a Bitcoin surpassed that of an ounce of gold for the first time. Currently, all the bitcoin in the world is worth $41 billion. If that amount is hard to grasp, just think of it as one Larry Page – because $41 billion also happens to be the net worth of the guy who co-founded Google with Sergey Brin. You'll find both fortunes at the right side, and the lower end, of this graph, which gives you an idea of all the money in the world. You and I don't figure on it unless you're Larry Page. Or Bill Gates. The richest man in the world is worth $86 billion, or the net worth of Larry Page and Bitcoin combined – with enough change to buy the L.A. Lakers, the Toronto Maple Leafs, the Chicago Cubs and the Solomon Islands (not a sports team, but an entire country). Bitcoin is the Uber of cryptocurrencies: the biggest, baddest and best-known, but not the only one. 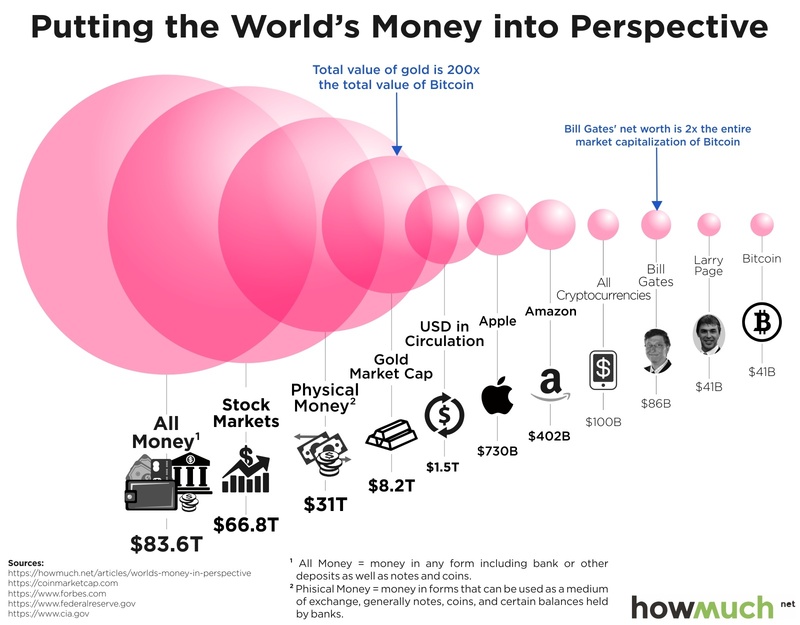 Add it up to Litecoin, Monero and all the others, and the total volume of virtual money floating around the internet, out of the reach of governments and banks, is a whopping $100 billion. That is about as much as the current GDP of Morocco – the 60th-largest economy in the world. The monetary value of tech giants like Amazon ($402 billion) and (Apple $730 billion) is equivalent to the GDP of much bigger economies (Nigeria and the Netherlands, respectively). In fact, you would only need a little more than two Apples to equate the amount of actual money in dollar notes and coins in circulation around the world today - $1.5 trillion. Money, of course, is fiduciary, which means it only has as much value as the trust we place in it. The same goes for gold: it derives its value solely from its rarity, combined with its desirability. The current world supply of mined gold is around 171,300 metric tonnes, which could be molded into a cube with sides of about 68 feet (20.7m). Its total value? Currently around $8.2 trillion. Or about 200 times the total value of Bitcoin (or Larry Page). Just to give you an idea: unless you own at least $205 million (i.e. 1/200th of $41 billion), the monetary distance between the net value of Larry Page and the world's entire supply of gold is smaller than the distance between Mr. Page's fortune and your own. If your head is not spinning already, consider the amount of narrow money that is held in banks and wallets, under mattresses and in piggy-banks around the world: $31 trillion. 'Narrow' money is defined as physical money: the coins and notes that used to be the standard form of currency before the rise of more derivative forms of payment, such as checks and electronic forms of money. 'Broad' money also includes the deposits in easily accessible bank accounts that can be converted into cash relatively quickly. The sum of money under this definition is $83.6 trillion. You will have spotted a flaw in the system: if the amount of money that can be easily converted into cash is almost three times the volume of the actual worldwide supply of cash, we would have a problem if we would all want to empty our accounts at the same time. Or we could all buy shares. The total market value of publicly traded shares at stock exchanges around the world is $66.8 trillion. Not only is that a fabulously large amount of money, it is also subject to the laws of supply and demand, and highly fiduciary. A run towards or away from stocks would thoroughly deregulate the global economy, and nothing more dramatic than a minus sign in front of that amount would lead to the collapse of global civilization.